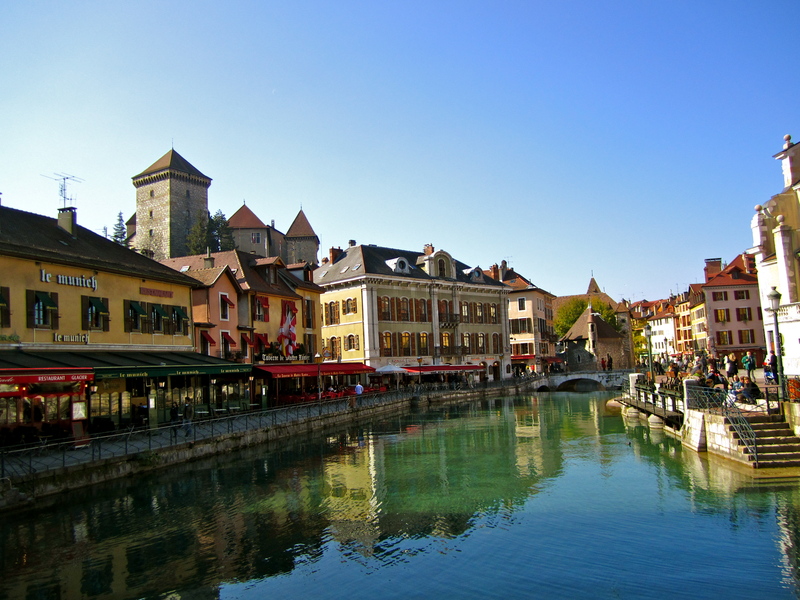 This morning we woke up rested and ready to explore Annecy. We’ve fallen into the worst habit of staying up really late so its definitely been a challenge getting up early. Thankfully most of our hotels are understanding of late risers and extend their breakfast until almost noon. So now that we’ve caught up on some much needed sleep first things first, breakfast! Of course I stuck with my usual cheese, bread, and salami with a few eggs. I could definitely get use to this menu every day! Our first stop today was the lake. Once you get through the town center the streets open up to the beautiful park over looking the lake. It’s one of the most beautiful sites I’ve seen. This isn’t your typical lake. The waters are crystal clear and vibrant blue. You can see straight to the bottom to the beautiful fish and rocks lining the earth. The birds perched on top of boats and ancient statues filled the landscape overlooking the water. 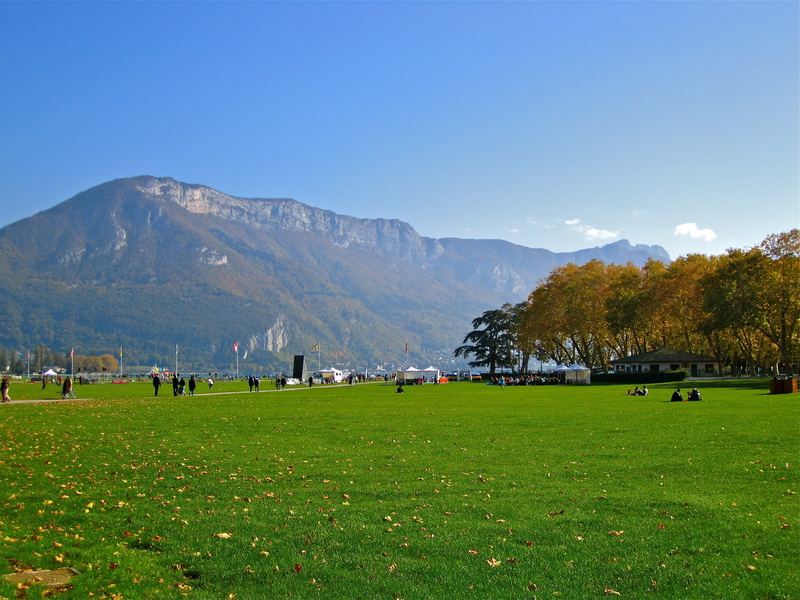 While we were walking the trail around the lake it became obvious why the French can feast and still look healthy….they play outdoors!! There were events and games for families to participate in. Carousels and dogs catching Frisbees filled the lush green lawns. This just doesn’t seem real to me. People take the time to sit and chat, enjoy their surroundings, and breath in the fresh mountain air. Needless to say my camera was getting much use. 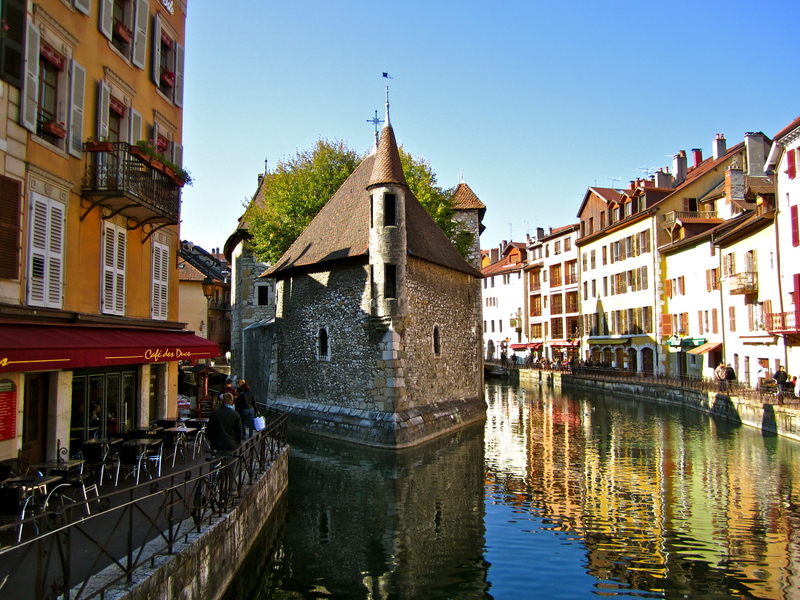 After some time by the lake we strolled through the old town area of Annecy and explored the different shops and Cafe’s lining the cobblestone pathways. 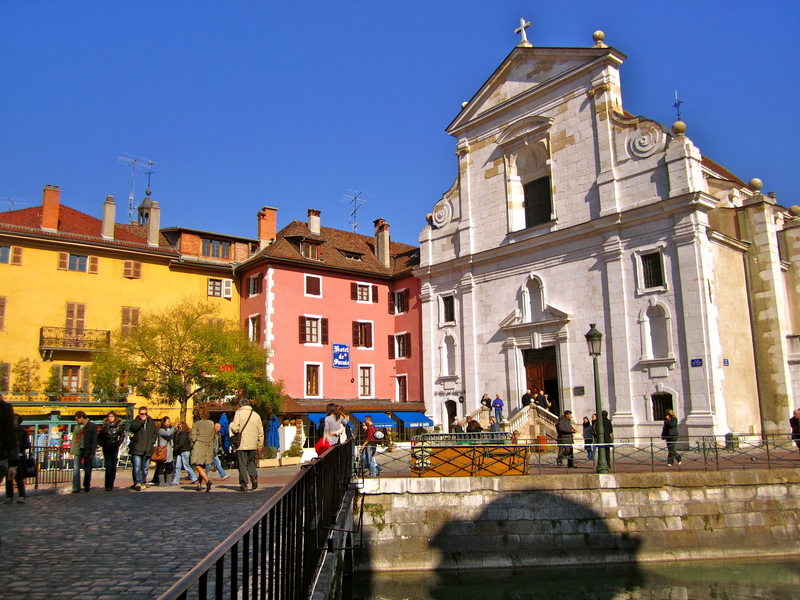 The best surprise was discovering the main square by the port that houses the old prison in the center of the square…the most photographed area of the city. The old stone walls surrounded by the beautiful mountain streams illuminated a medieval charm to something as dark as a prison. 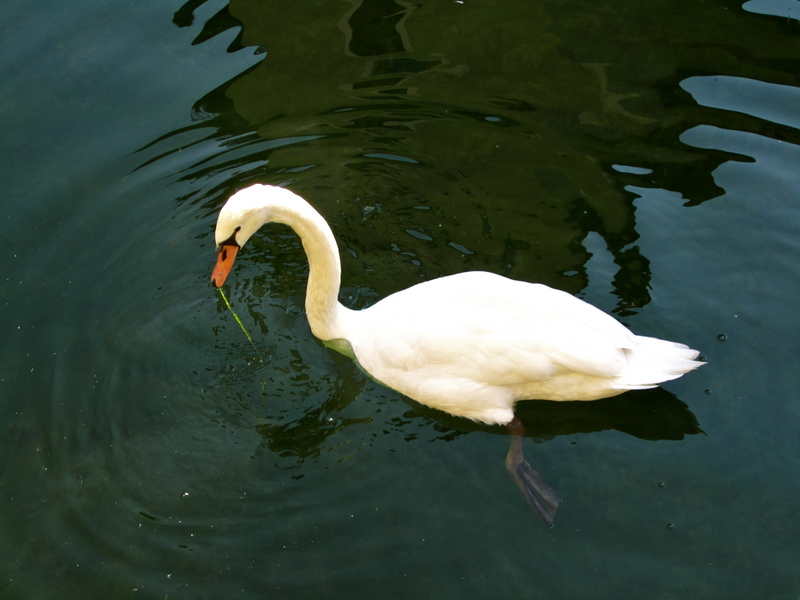 The swans and multiple species of birds fought for attention from the tourists and beautifully occupied the sky above. After a few hours strolling through Old Town we needed a snack. Eating a late breakfast kept us pretty full so we opted for a sandwich while we finished our stroll. 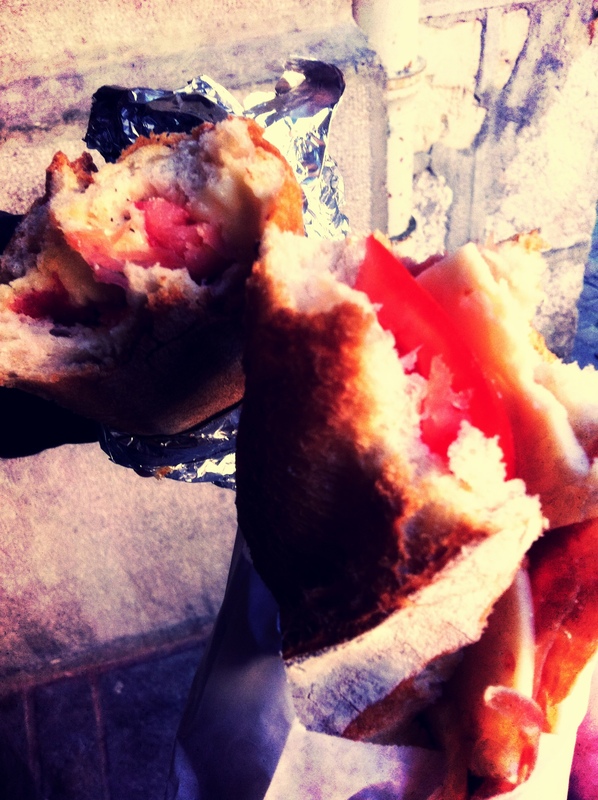 The French love ham – Jambon! I have rarely seen chicken and ham is definitely the choice of meat for everything. So with our atrocious attempt at French we ordered our sidewalk sandwiches. I kept mine cold and Matt ordered his hot. His was definitely the winner. Mine was good but his bread, ham, and a mountain of hot cheese and pepper smothered on French bread was way more satisfying. Halfway through Matt mysteriously got a cold ham and cheese sandwich and I was enjoying a hot sandwich on a crunchy baguette…thanks honey! After our snack we decided to head back to the hotel for a break when we saw a sign to the Musée-château. 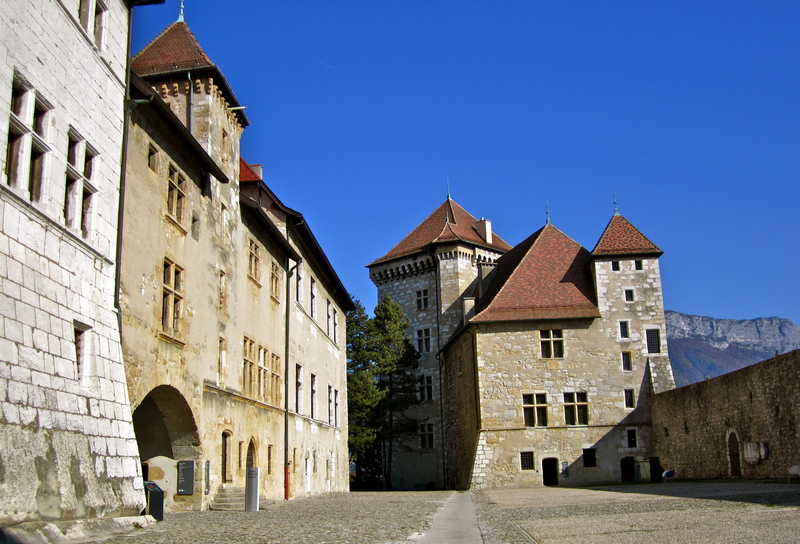 Two hours later we were still exploring the magnificent museum in Annecy’s oldest structure. 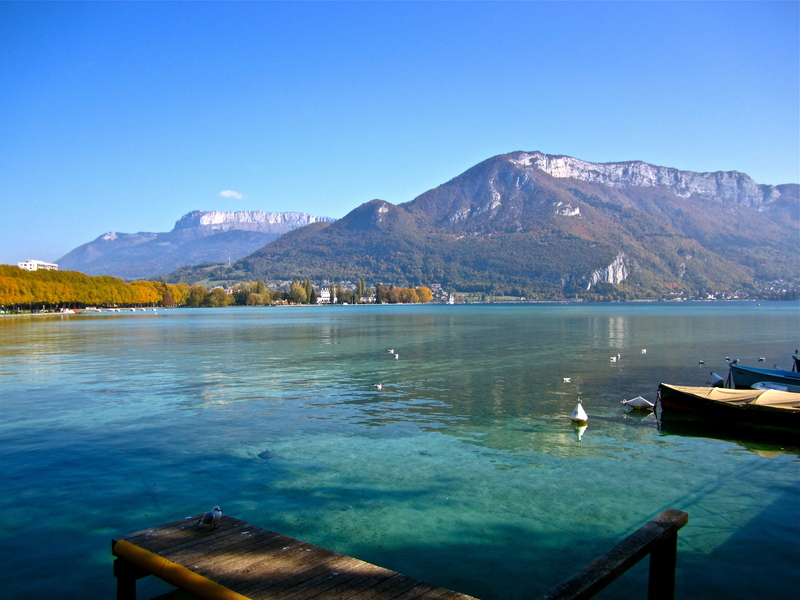 From medieval to modern artwork to the documentation of centuries of species discovered in the crystal blue lake waters, the history of Annecy was a must have experience! We completed the tour with some amazing photographs of the city from atop the magnificent castle. 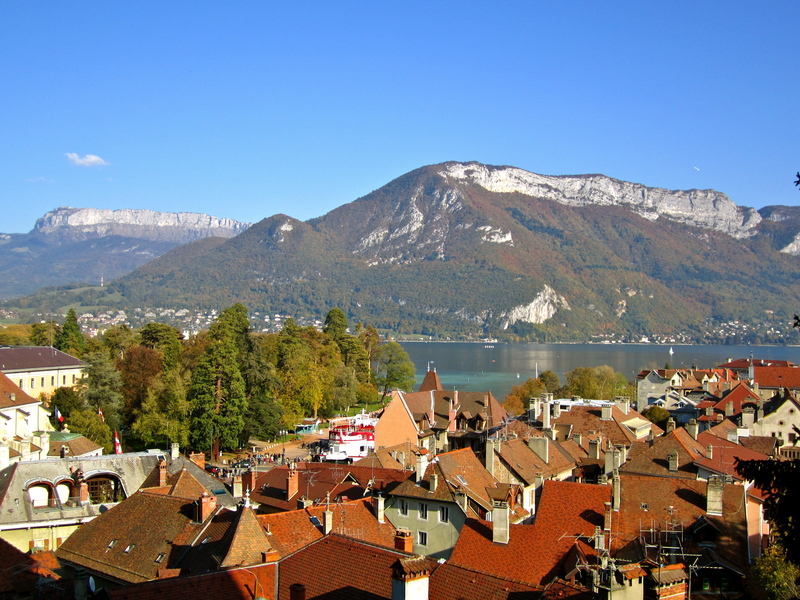 The city sitting directly below the Alps next to a crystal clear lake is a trip you have to make! Breathtaking. After our tour we headed back down to the square for a beer and people watching break. It’s more fun to sit and watch the multitudes of different cultures walking the streets. A few hours later after a stop at the hotel and a quick nap we headed out to dinner. 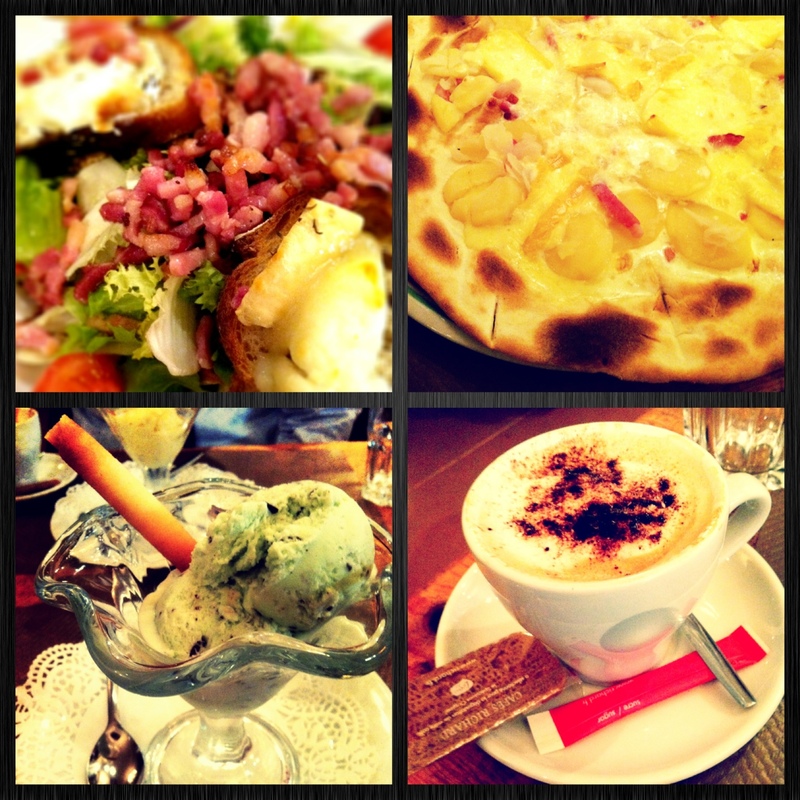 For the last week we’ve had some amazing French cuisine, but we were ready to eat some Italian food. So for dinner it was pizza and wine at one of the sidewalk pizzerias. The food was absolutely delicious. The vinaigrette from the salad blended beautifully with the ham and goat cheese. The pizza was incredibly rich but the cream and cheese with the crispy potatoes made for a decadent French pizza. The one thing I found bizarre was that they didn’t cut the pizza…they just pulled it out of the oven and served it on a platter. Either way, it was eaten and enjoyed. For dessert I had the double mint chocolate chip ice cream and cappuccino. Another thing I could get use to is dessert and coffee after every meal. 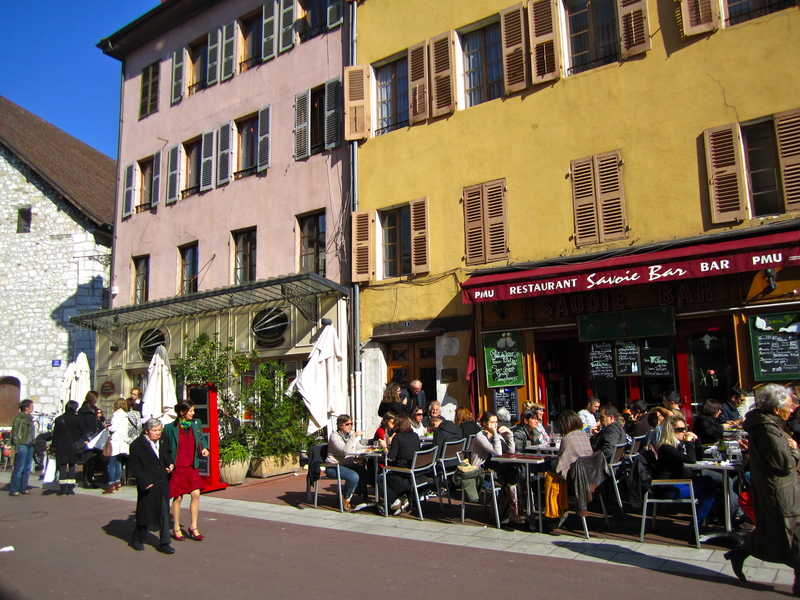 Something I’ve noticed about French dining is everyone orders for themselves…an appetizer, entree, and dessert. There isn’t much splitting happening. After the amazing pizza, wine, salad, dessert, and café it was time to walk it off. We headed back to our neighborhood bar for a nightcap then back to the hotel for some rest. 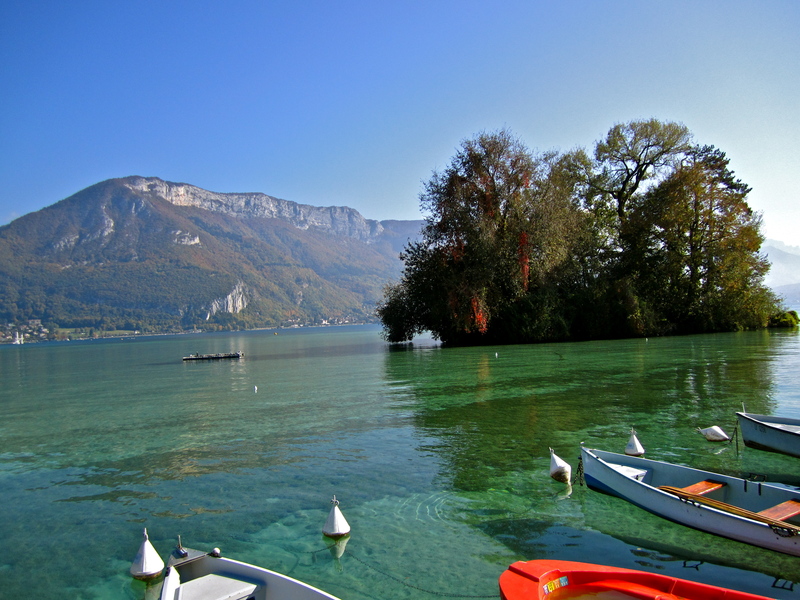 Tomorrow we’re planning on taking a boat tour and enjoying some more of the beautiful lake! Sounds like another beautiful adventure! 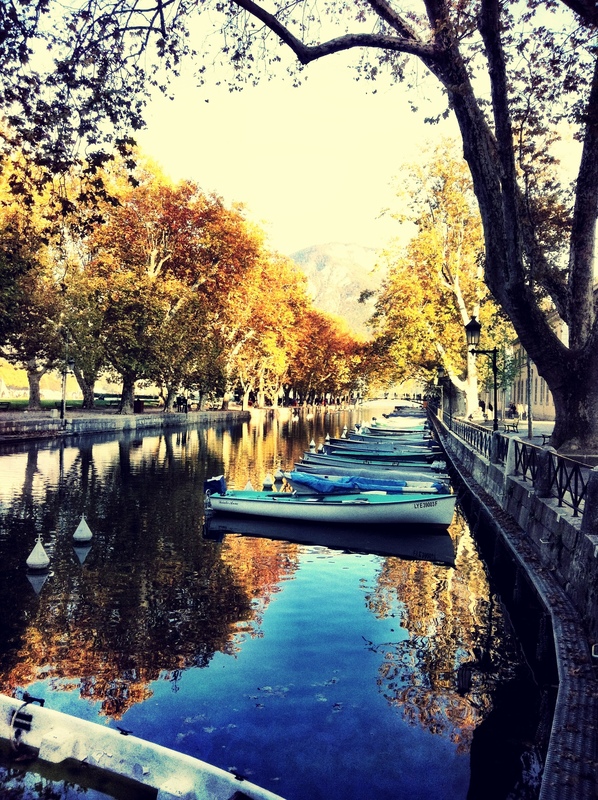 I love the photo of the canal with the the boats lining the bank – such beauty is fabulous, and I am sure it doesn’t even do the scene justice! My one problem though…cheese, bread, and salami with a few eggs…for breakfast?! Oh my, I can feel my tummy hurting already! !